This set of two swing arm fixtures is the perfect way to provide lighting and visual flair for a bedroom, seating arrangement or buffet. The perfect way to provide lighting and visual flair for a bedroom, seating arrangement or buffet. In a bronze finish with faux leather shades. 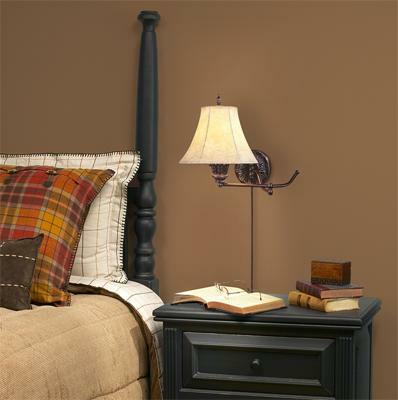 Both wall lamps come with a six foot cord and plug into a regular outlet. • Each takes one 100 watt 3-way bulb (not included). • Backplate measures 5 1/2" wide. • Extends 20" from wall. • Shades measure 5" across the top, 11" across the bottom, 7 1/2" on the slant, 7" high.